Multipurpose Mobile stand is an ideal cost effective gift for the people on the move whether your employees or customers. It can be fixed on the windscreen or table for more ease and comfort of use of your devices which can be either smartphone or tablet. The super strong suction ensures that your devices are safe and flexible with rotating head for the perfect angle for ease of operations of the devices. 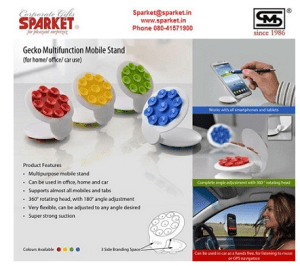 What is the multipurpose mobile stand? Whether you are at home, office or in your car the stand will make your life easy to use the smart phones or tablets. It can be fixed on the table or wind screen as a hands free, for listening to music or GPS navigation. You will find that the ease and use of smart phone and tablet is much more comfortable with multipurpose mobile stand. The device has been designed to give you 360 degree rotating head with 180 degree angle adjustment making it very flexible to adjust to any desired angle. The super strong suction ensures that your expensive devices are safe and secure while in use. For promotional purpose you can put your logo to any of the 3 sides with extra branding space for more impact. Apart from white base color you have a choice of red, blue, green and yellow color to go with your device or decor. Wholesale Price Range Available on Sparket.. The MRP of the product is Rs.125 but on bulk buying it will be offered at an attractive price depending on the exact branding, customized packaging and quantities.